Get ready for some Fire Works! July is here and things are heating up with Pahl’s Landscape Department. We had a great month of June and are looking forward to what July will bring. This month I want to share a job we did in the back yard of a client’s home in Lakeville. This is a project that I bid last fall. I met with the homeowner back in September of 2017, they took me to their back yard and were wanting to re-do the back yard patio, incorporating a fire pit with planting beds around the patio area. I took the measurements and pictures I would need to bid this job and brought it back to the office to put together a proposal. When I was visiting with the client he told me this was something they were going to proceed with in the Spring of 2018. We got together in February to go over the paver options and plant sketches. Once we received the half down payment and signed contract we put them on the schedule and were able to start the job this past May. 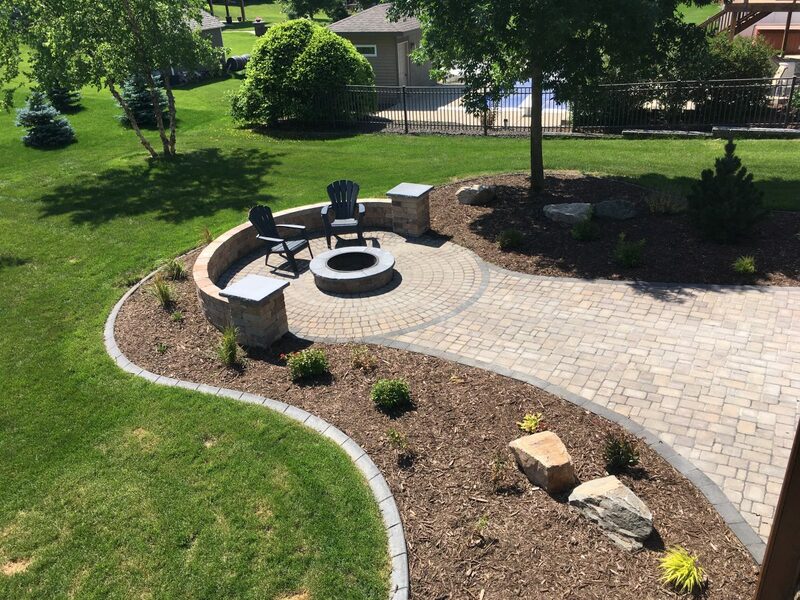 This project consisted of removals, disposal and installation of a paver patio, a fire pit, a freestanding wall with pillars, plant material, boulders and mulch. The day we got to the job I went around and marked out the bed lines and new patio with paint. I spent time walking through the project with the crew so they had a good vision of what was going to take place. The crew then began the demolition part of the project, removing the existing concrete patio and the sod/soil for the new patio, walls and planting bed. When they finished up with the removals they began to bring in class 5 base for the wall and patio. Once the base was prepped they started building the free standing wall, retaining wall, and columns. The wall and columns were built using Borgert Strassen wall block, Minnesota River color with 2-Silver Creek Pillar Caps, Bluestone color on the top of each Column. After the walls and columns were up, we set in the fire pit using a Rochester Grand Fire Ring Kit, Beechwood color with Silver Creek Edge Cap, Bluestone color. Now it was time to start laying pavers. We installed a 15’ circle paver patio around the fire pit with a border that carried through to a random pattern patio with a border as well. Once the pavers were laid we put in the paver edging and ran over the entire patio with a plate compactor and applied polymeric sand to finish the patio. The paver patio consisted of using Borgert Cobble Circle Series and Borgert Cobble Series Minnesota River color and Onyx color border. Once done with the bulk of the project it was time to start the finishing touches. We installed soil throughout the landscape bed and had to step away from the project to have Curb Creations come in the lay the concrete curbed edging. After the edging was installed we came back and installed the plant material, fieldstone boulders, preen and mulch to finish off the landscape beds. The last thing to do was put down soil and sod to fix the turf that was damaged from the installation of the project. After the project was completed I did a walk through with the homeowner and made any minor changes that needed to be done. He was very happy with the outcome of the landscape project and it was it just like he envisioned. I am excited to share another beautiful project done by Pahl’s Market Landscaping next month.